The Internet's Cicada: A Mystery Without An Answer Two years ago, strange sets of bewildering puzzles appeared on the Internet, with a message encouraging "highly intelligent individuals" to try to break the code. The code led to more clues spanning a global Internet mystery, that has yet to be solved. 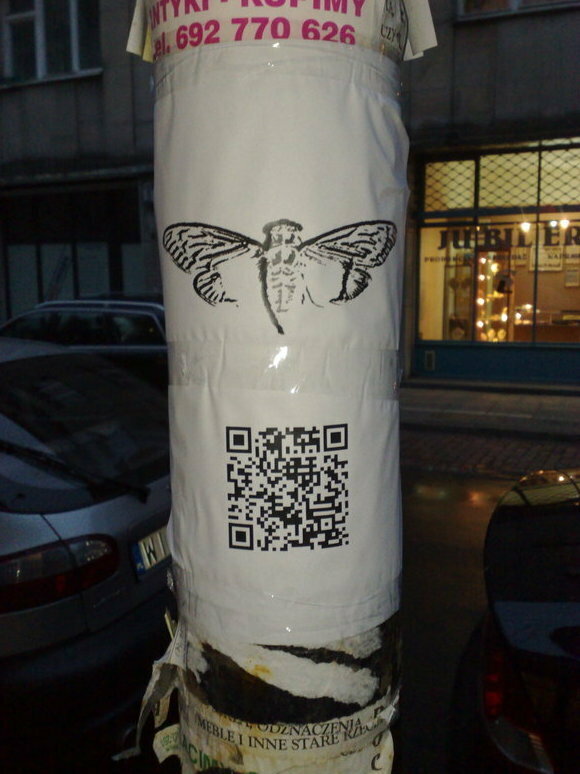 A poster found in Warsaw shows a QR Code for a website related to the Cicada 3301 mystery. "Hello. We are looking for highly intelligent individuals. To find them, we have devised a test. There is a message hidden in this image. Find it, and it will lead you on the road to finding us. We look forward to meeting the few that will make it all the way through. Good luck." That message, signed "3301," appeared on the underground message board known as 4chan two years ago. It was mysterious, cryptic and sparked a global Internet mystery that has yet to be answered to this day. "It's like a Dan Brown novel if Dan Brown could write this well," freelance writer Chris Bell tells NPR's Arun Rath. Bell wrote about the online mystery for The Telegraph. "It's beyond the realms of my intelligence and beyond the realms of any individual's intelligence to do this." Thousands of people took on the challenge. To code-breakers who dwell in this world, it was simple in the beginning. The first puzzle used a technique called steganography, concealing a message or image within another image. Hidden inside that first seemingly simple image — those black words on white text — were many more pictures, codes, clues and the reoccurring image of a cicada. That's what gave the mystery its name: Cicada 3301. "It's a bit like the moth imagery in a Thomas Harris novels like Silence of the Lambs," Bell says. "So it began to symbolize the entire puzzle as it started." If you decoded that first image, you were led to a website. That website contained more puzzles, even harder ones. And that's why Bell says so many more people joined in, because no one person had the skills to solve all of the puzzles. Extremely obscure knowledge was needed to crack these codes, from Medieval Welsh literature to Victorian occult numerology. Eventually the clues led to 14 different GPS coordinates, Bell says, in places like Hawaii, Moscow and Warsaw. "When people visited these locations, they found the cicada image there again and a further clue," he says. This was one of the most complex puzzles the Internet has ever seen. "And this is why people slowly started to realize that maybe it wasn't just some kind of lonely, random neckbeard sitting in his mother's basement, this was an international game," Bell says. Bell says that as the puzzles got more and more complex, people started to suspect that perhaps a military organization was behind it, perhaps the National Security Agency. He says many people suspect it could also be the CIA or various security services. Some people, working in teams or individually, cracked the code and made it to the end. So what happened? 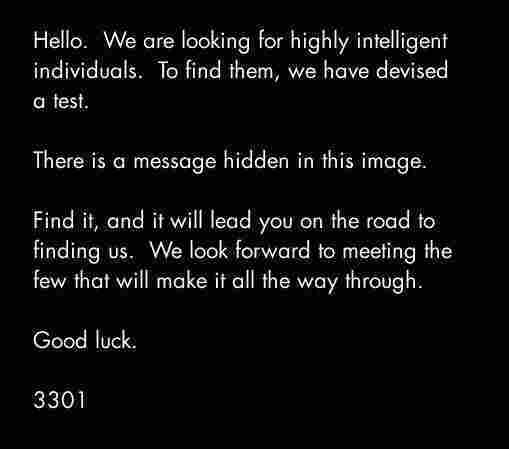 No one knows, Bell says, and that is part of the enduring mystery of Cicada 3301. "After it got through all of these tests the first time around it led to a website on what's know as the 'darknet' ... and once a certain number of people had accessed it, it closed down, and left a message: 'We want the leaders not the followers.' "
Bell says for many people trying to solve the mystery, it was a huge disappointment. No one is quite sure what happened for the select few who made it. He says there are a lot of different rumors, but none of those who were successful have talked about it. "They reckon there's anywhere between a dozen and two dozen people who made it to the final website," he says. "Apparently they had to build a computer server and register certain addresses. But they never revealed who was behind the tests to begin with; the path led and stopped." But on Jan. 5, 2013, it all started over again; the puzzles appeared with different techniques and new physical locations. It again led to a website on the darknet, and once again it closed once a certain number of people got through. This weekend, a ton of new puzzles appeared. But Bell says all of the ones he has checked out have been fakes. And so the mystery still continues, and he says it's become something special now. "It kind of tapped into all the things the Internet loves in a way," he says. "It tapped into slightly ludicrous conspiracy theory, puzzles and then the greatest thing of course it did was it never reveal it's purpose or it's aim. For thousands of people who sat at websites to try and decode these puzzles it's been a real labor of love."